The mass arrest of the Templars on October 12th 1307 was brilliantly planned and executed. Everything had been meticulously set up in advance: sealed orders had been sent out to royal officials in mid-September, and letters written to the Pope and the other kings of Europe, giving king Philip’s reasons and suggesting they should follow suit - though in fact few took such serious action, at least not initially. King Philip's letter spoke of the Templars as "unclean people" who "defile the land with their filth,remove the benefits of the dew and infest the purity of the air". Preaching friars, who traditionally hated the Templars, were despatched to explain to the people what had happened, together with the crucial announcement that all debts owing to the Order were cancelled forthwith. Not surprisingly in the light of this, there were no popular protests. Not the least detail of these preparations had leaked out, and the victims suspected nothing. Then in the one night, about 15,000 men were seized all across France: knights, sergeants, foot soldiers, chaplains and labourers. All went quietly; there was no resistance; only a handful seem to have escaped. Philip’s leading minister, William de Nogaret, personally arrested the Grand Master, Jacques de Molay. Special courts were set up to examine the Templars, run by the Friars, their enemies, but with royal officials present. The proceedings were by inquisitorial methods, such as had been used in the previous century against the Albigensian heretics: the accused were not told the precise nature of the charges, or who had informed on them, but were invited to confess and to denounce others. Those who refused to co-operate could be subjected to savage torture. In Paris alone, 36 Templars died under interrogation, and others were so weakened they needed to be carried to make their public confessions. It should be remembered, however, that many of those interrogated were not hardened warriors but others attached to the Order: priests and servants, workmen and shepherds; some of them old men and others mere teenagers. Such people would be unlikely to resist Nogaret's interrogators for long. Also, modern experience shows that extreme physical torture is not often necessary for getting results: sleep deprivation, semi-starvation, bullying and threats and the extinguishing of all hope are frequently enough to reduce victims to grovelling compliance. Furthermore, the courage of the battlefield is quite different from the moral courage needed under this sort of pressure. The charges against the Order, which were immediately given maximum publicity throughout France, were an odd sort of rag-bag. The Templars, it was said, betrayed the Holy Land to the Saracens; they held their own heretical religious services, they were actively homosexual, their initiation rituals included such blasphemies as spitting on a crucifix and denying Christ, they practised black magic, and worshipped the devil. Not surprisingly, many confessions were soon forthcoming, though these included a high degree of prevarication. Jacques de Molay, for instance, admitted that the initiation ceremony involved spitting on the cross, but said that in his case he had deliberately missed! Other knight said they knew such rituals happened, but denied personally taking part, and others said that they had presumed that some of the more disgusting practises were merely intended as tests of their absolute obedience; comparable to God’s command to Abraham to sacrifice Isaac. Jacques de Molay confused the picture by writing an open letter to all Templars, urging them to make full confessions. The question of the actual guilt of the Templars remains a mystery. The easiest explanation is that they only confessed under torture, or threat of torture; or that they were promised immunity in return for co-operation and then double-crossed. There is, of course, the possibility that at least some of the accusations were true. (Once again, the parallel with Stalin’s purge trials is obvious) But no hard evidence was ever produced. In the case, for instance, of devil-worship, the image adored was variously said to be a cat, a human skull, a carved head, or an object named Baphomet (clearly a corruption of Mohammed). No image of any kind was found. The most obvious motive for king Philip’s actions would be that he was perennially short of money. He had previously taken violent action against the Jews of France and the Lombard bankers, and he now proceeded to seize all Templar property. It is also likely that, as a moderniser and centraliser, he was jealous of the Order’s independent power within his kingdom. Then again, he may genuinely have believed in at least some of the charges, and thought they ought to be investigated. But who except the Pope was entitled to judge the Templars? Pope Clement made a feeble protest against French actions, but when Philip’s propagandists responded with violent personal attacks, he duly surrendered and published a Bull ordering all the kings of Europe to act against the Templars. There were arrests throughout Europe, but only in France was such extreme brutality used to get confessions. When Edward II of England (who was king Philip’s son-in-law, it may be remembered, and had only come to the throne a few month earlier) wrote to say that he could find little substantial evidence, he was informed that he was not employing sufficient torture! Since under English law judicial torture had not previously been used to extract evidence, special skilled torturers had to be imported from France to carry out the work! The University of Paris ruled that, in emergencies, the king was justified in arresting heretics without prior authorisation from the church (the catch being, of course, who decides what constitutes an emergency?) Pope Clement ordered a special commission to meet to consider the case, but, in the interim, ruled that Templars could be tried by local bishops - who, of course, had always hated them. The Archbishop of Narbonne set up a court, and invited all Templars who wished to defend their Order to appear before him. This was actually a very serious matter: heretics who confessed their errors might be imprisoned or suffer other punishment, but were not executed. However, any who repudiated their confessions were deemed “lapsed heretics”; the Church would wash its hands of them and hand them over to the royal government (the “secular arm”) to be burnt at the stake. Therefore many Templars were cautious about accepting the offer, and Jacques de Molay caused yet more confusion by first reiterating his confession, then rejecting all charges, and finally producing a watered-down version of the original confession. In fact de Molay appears throughout the story as a confused and frightened old man, quite unable to cope with the pressures he was under. Nevertheless, in 1310 no less than 546 Templars came forward to denounce their confessions as being merely the result of torture. One knight is said to have brought along a bag containing bones from his own feet! A priest attached to the Order, Peter of Bologna, was brave enough to come forward and speak in their defence. King Philip sensed, to his alarm, that public opinion was beginning to swing back towards his victims. Pope Clement's interventions, though feeble, had had the effect of dragging out the proceedings, when Philip would have preferred a quick settlement. In 1311 the Archbishopric of Sens, which had authority over Paris, fell vacant. King Philip nominated for the position a young man with a somewhat dubious reputation, but who had a supremely important qualification: namely, he was the younger brother of Enguerrand de Marigny, the king’s Superintendent of Finance. Pope Clement made another feeble and ineffective protest. The new archbishop at once proceeded to try those Templars under his jurisdiction. 54 Templars who had rashly repudiated their confessions were condemned to death as relapsed heretics and burnt at the stake the same day. All proclaimed their innocence even amidst the flames. Public opinion became increasingly uneasy. 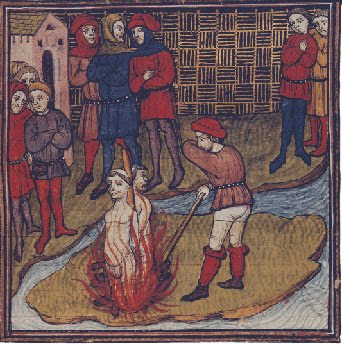 Altogether around 120 Templars were burnt, and, not surprisingly, many others reaffirmed their guilt in order to save their lives. Peter, who had acted as their defence spokesman, was imprisoned but possibly escaped, and disappeared from the picture. In March 1312, at a church council held at Vienne, under more heavy pressure from king Philip, Pope Clement issued an edict abolishing the Order, and the remaining Templars were dealt with by local ecclesiastical courts. Following established practice, those who publicly confessed their guilt were not executed, but condemned to imprisonment or lesser punishments. The grand finale took place in Paris in March 1314, in a public display which was to be king Philip’s triumph. It forms the basis of another great legendary story, which runs as follows. The last Grand Master, Jacques de Molay, and three other senior Templars were paraded outside Notre Dame cathedral to make a full confession to all the charges against the Order before being sent to life imprisonment. But instead of following the script, Jacques de Molay now rose to the occasion and made a ringing defence of his Order, proclaimed its innocence of all charges, and said that all confessions were merely the result of torture. The Preceptor of Normandy, Geoffrey de Charnay, supported him. King Philip’s intended triumph had become a propaganda disaster. Only one thing could now be done. The very next day, the bonfires were set up on a small island in the Seine, and the last Grand Master and the Preceptor were burnt at the stake before an amazed crowd of spectators, some of whom sneaked back during the night to gather up the remains as holy relics (See the contemporary illustration at the top of this essay). It was the end of the Knights Templar, but not necessarily the end of the story; for it is said that even as the flames engulfed him, Jacques de Molay cursed king Philip and all his line, prophesying that Philip, his chief minister William de Nogaret and Pope Clement would all meet him before God’s judgement-seat within the year. This did indeed happen: all three died that same year - and the consequences for the French monarchy and the papacy were even worse! See the third and final part of this essay, entitled "The curse of the Templars", for what followed! Anyone who goes against the State loses. The reason is indeed money and control -- no one should be richer and more powerful than the State. The state is a kind of machine capable of crashing any opposition (unless it clashes with another even more powerful state, that’s why it’s nearly impossible to crash the state from the inside) and controlled by some obscure forces, never mind the rulers or regimes -- the form changes, but the essence is always the same. The concept of the "state" as we know it today did not exist in the early 14th century. It dates from the Renaissance in Italy, particularly in the writings of Machiavelli. However, it would be correct to think that King Philip's battles with the Templars and the Papacy were an important step towards the modern state; fully sovereign within its own borders. The Knight Temple Mount and returning to European countries, the Templars suddenly began gaining wealth and reputation. Within a very short time the Knights in combat Templars had become the richest group in European countries, if not the world.